–California Mobile Kitchens offers a full line of customized mobile kitchens for any reason, including special events, kitchen renovations, film sets, concert events, tours or emergency situations. • What is the menu? • What is the volume of meals served per meal period? • What is the number of people in the kitchen staff? • The duration of the project? • What is the available dry, compact level ground on the site? • What is the available refrigeration, freezer and dry storage space? 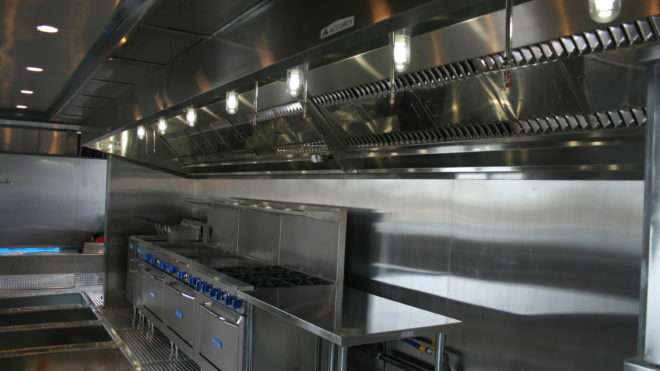 The mobile kitchens are available in varying lengths: 20 feet, 36 feet, 40 feet and 46 feet. The mobile kitchens, and other rental items, are available for short-term and long-term temporary use. Medeiros founded the company with her husband, Tomas Medeiros Jr., who is a principal and vice president of the business, in 2009. Her passion for the food service industry developed growing up in a family that owned and operated a catering business. “With that upbringing, I learned that the key to success is having morals, ethics and, most of all, hard work,” said Carly Medeiros, who studied marketing at Woodbury University in Burbank and worked for MedCorp in marketing and administration. Tomas Medeiros Jr. has more than 20 years in the food service industry, having managed food service contracts exceeding $35 million for government agencies. He has designed and managed dining halls and cafeterias and catered events for the United States military. He attended John and Wales University for Culinary Arts and Food Service Management. For more information, call (805) 434-6172 or (877) 862-6189, email support@californiamobilekitchens.com or go to www.californiamobilekitchens.com.